Legitimate reasons justify workers interest for remuneration. However, believing that money is a panacea for your workforce is a lure. Employees are your company first richness so you should be involved in their welfare. As the manager of your company, you will probably meet a panoply of employees with numbers of profiles. No matter their types, employees generally want to prove themselves, to be totally trustworthy and to progress on their job. This fact already proves that money cannot be enough. Nevertheless, let us define employees common needs that will help you know how to better manage them. Do you pressurize your workforce? Is the work environment up to standards? Answering these questions right now will help you understand why your employees do what they do. When work becomes a chore for your employees, instead of enjoying it, they get frustrated. That’s the reason why it’s important to create stimulant workspaces: airy, well lighted, colored or decorated. You can even hang some inspiring prints around to motivate and recall your collaborators your common ultimate goal. Besides, stimulant workspaces also stand for interpersonal relationship. An environment in which colleagues have respect for one another, demonstrate integrity, solidarity and where everyone finds his place is nothing but comforting… Whatever field of activity you’re dealing with, the watchword is the same: build a unique, motivating and inspiring workspace for your employees. An employee may be aware of doing well, but only the appreciation of his boss can give him that certitude. When you say “hey, you’re doing great!” or bravo, congrats etc, you’re indirectly saying to your worker “I am satisfied with your work; you can do better”. Moreover, acting that way, you’re not just enhancing his work but himself too. The causal relationship helps you contribute, adjust, or raise his self-esteem. One thing many ignore is actually that having self-esteemed employees is beneficial. That’s noticeable in the company’s productivity but also with the products quality. Complimenting your workforce is somehow also implying this: “you are with us, you are a member of this company and your contribution is appreciated”. A fresher in the company will get reassured and forget about his constant firing fear to concentrate all his energies on your company’s productivity. Human beings are happy when they know they’re useful, when they’re adding a plus to something and making impact. They become engaged and super motivated. Hélène Weber, psychologist and doctor in sociology in her article “McDonald’s Employees and their Psycho-organizational adhesion to the organization” talked about the personnel treatment. She said McDonald’s employees were actually acknowledged, desired and invested from the start. Hence, a succession of good tasks and well accomplished missions should call for a reward. Compliments are nice, rewards are reinforcing and edifying. An employee that got a promotion would strike while the iron is hot to remain in the boss good graces. Rewarding or promoting someone is also addressing others a message like this one: “that’s what it takes to do your work with dedication and care”. Complimenting, rewarding and promoting your workforce implies being attentive, hold regular 1-on-1, and help them when they’re stuck. The Maslow hierarchy of needs perfectly illustrates it all. 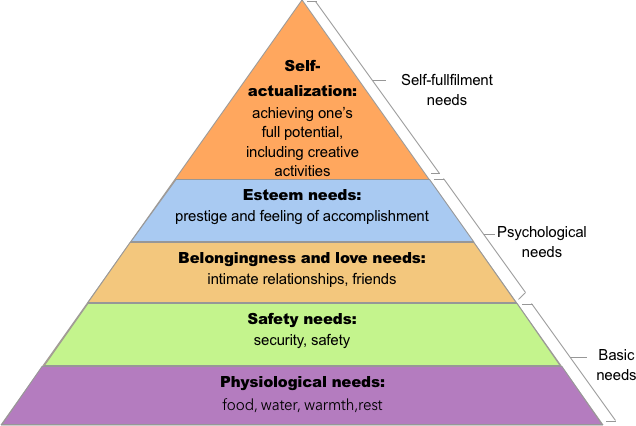 That’s a five stages pyramid demonstrating that basic needs are right followed by psychological ones. The equation job=money is then not sufficient for happier employees. Money is not enough to motivate your workforce. It takes time to build a real relationship with your employees nonetheless it helps you settle the field for a long-term connection. Defining your objectives and seeking for employees that can help you reach them can make things easy. In short, provide your employees with fair wages and show empathy. Employees are your first richness and their performance counts for your company success and growth. Before you go, you can express your thoughts in the comment session below. And please click and hold down the 👏 button for 10 seconds to show your support!